I've started a Flickr group for the Outside Oslo fabric line, so if you make something using these prints, go show it off in the gallery. I will ooh and aah over your work! There are a few photos uploaded already, but they could use some company. 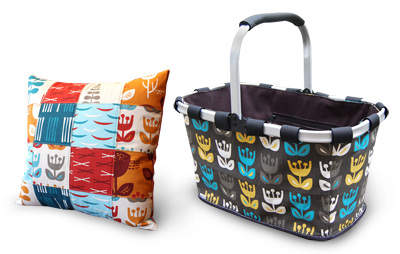 Above, a pillow by The Needle Shop and a basket by Ikat Bag. Fabulous. On an unrelated note, Blogger has been experiencing wide-spread technical difficulties for the past 24 hours. Yesterday's missing post has now emerged from the Bermuda Triangle, but without yesterday's comments. Apologies! I just LOVE this fabric! Wish I had the money to buy a whole stash! Excellent. I will publicly aaaaah. If your Mum gets the aaahs, I would request the ooohs. We are working on simultaneous (as soon as my fabric arrives--ack!) identical (but different) projects. Does that even make sense. Probably not. But it will become more clear in the not-too-distant future. Alas, my missing Basket Post is still missing from my blog. Am glad I uploaded the photo to your album since it's nowhere else to be found now. Thank you for featuring it! love the pillow!!! Sweet dreams with that baby!!! Do you ship the fabric to outside Oslo too? i am loving your fabric. i've made a couple collars using your ribbons, which i also love! I need that basket. I will dance down the street with it and everyone will cry with jealousy! Thank you for this post and for including photos and a Flickr group info for this very pretty fabric. I'm a regular reader from Tunis in North Africa and this is the first time I have posted a message. Thank you. Thought maybe there was too much backlash about hiding the children. Glad the other readers have a sense of humor.